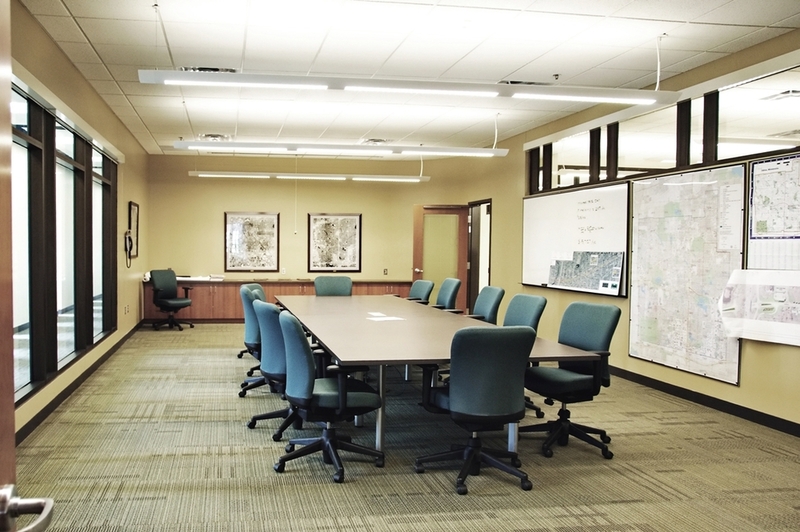 Edina Public Works Facility — OERTEL ARCHITECTS, LTD. This building and site were chosen after years of looking for suitable sites. Edina has limited real estate available for such large projects, but the previous inhabitants operations were of a large enough scale that the existing buildings and site layout were reasonably cohesive with the Public Works plans. Tearing the existing building down was debated, but it was decided that the least environmentally friendly option would be to “tear down a block building and replace it with another block building.” Essentially we took an old popcorn factory and turned it into a public works building. The 138,000 square foot facility includes renovation to an existing building and additions to the former popcorn factory. The facility is not LEED certified, as city council could not justify the expense, but LEED principles were followed. Numerous energy conservation strategies were studied and implemented into the building and site, including a geothermal system. The project also used an innovative site storm water treatment technique of installing two 300-foot by 4-foot by 3-foot rock infiltration treatment trenches, which took up a small footprint while still meeting water quality requirements for the site. The system was installed around the newly constructed geothermal field system and piping network within the parking lots. The firm also designed a small storm water treatment pond which provides additional infiltration, sediment removals, and storm water runoff rate control. The pond was contoured to preserve mature pine trees and other existing landscape features on site. Oertel Architects, Ltd. ©2018. All Rights Reserved.